There are some words in the English language that even the most advanced linguist would have trouble defining and identifying. So, how is it possible for Cheshire third graders to be prepared for a language that contains words such as cachepot, kaleidoscope, and paradigm? Spellings, definitions, pronunciations, and more are found in common dictionaries but, unfortunately, not everyone has access to these books. The Cheshire Grange is looking to change that, however, with a Words For Thirds program that aims to arm each third grader in Cheshire, each year, with a new dictionary. "With all the budget constraints, we wanted to help," said Marge Bernhardt, a member of the Cheshire Grange. "We hope to get support from the Town and help these kids." 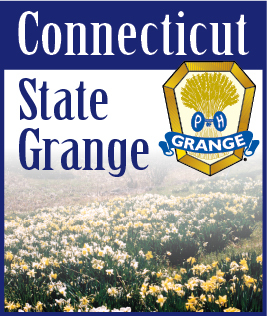 The National Grange sponsors the dictionary project, but this is the first time the Cheshire Grange has participated, Bernhardt said. Money that was raised from last year's Fair and other activities was set aside and paid for the dictionaries for this school year. "They were back ordered, but will be presented. We already have our foot in the door and have voted to make this a yearly project," Bernhardt said. "So many Grange towns are small. In some instances, we have as many third graders in town that they have in their whole school system." The dictionaries that are presented to the third graders are then "theirs to keep," Bernhardt explained, and she hoped they would keep them throughout their school career. The paperback dictionaries are light and fit into backpacks, so it is not a burden for students to carry them. Thus far, 400 dictionaries have been purchased for third graders in Cheshire, with the hope of more to come, Bernhardt admitted. "The enthusiasm has built the more we've talked about," Bernhardt said. "Volunteering and town involvement is very important to help the students." The Cheshire Grange has always had its hand in volunteerism in the community, from working with convalescent homes to helping out around Christmas. The group has never assisted the school system before, so this is "one more dimension" to the Grange. "The budget crunch has been brought to the forefront and we want this to be an ongoing project," Bernhardt said.